Just heard that actor, racist, and violence advocate Charlton Heston died last night. If you're wondering about my dark opinion of Charlie, see his interview in the film "Bowling for Columbine." Here is a cartoon I did about him a few years ago. I got waves of hate mail from rabid NRA members, who worshiped him as a messiah. If his body disappears from his tomb in three days and he returns to save the country from pacifism, I will stand corrected. I did not like Charlton Heston's politics. I did see so many memorable films of his while growing up, with so many classic lines from him that I am sad to see him go. 1) Michael Moore, of course, has a long history of truth-telling and so he is an excellent source for that sort of thing. The Times of London confirmed that Moore essentially lied about a mess of stuff concerning Heston. 2) If you're going to call Charlton Heston a racist, you should at leat acknowledge that he marched with Rev. King back when that sort of thing could have killed his career. 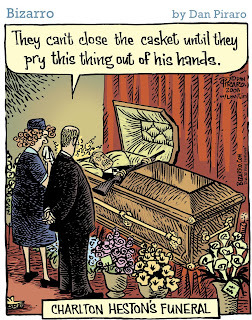 When I heard of his passing, I immediately remembered this cartoon, and it came in handy to tell a joke. Anybody who doesn't stockpile weapons as a "hobby" should find the NRA's gun-fetish very disturbing. Mr. Heston chose to become a symbol of their twisted logic, so the criticism is well-deserved--in life or in passing. Of course, let's not remember the guy only for his mistakes. He was a hoot in Planet of the Apes. Yeh, you know, when he was younger, he did march in civil rights marches, publicly, for a good cause, but as he got older, he veered rightwing, and sad how he got into all the NRA crap and conservative shite. But his early life was full of good thinking and actions, so even though there is no Christian God for dear Charlton, God Bless him anyway, he did his best, even though his best was not always so good, especially the final half. I still remember going to watch the Ten Commandos and Ben Hur as a kid in the 50s, not my 50s, the 1950s....... he was one of my first cinema heroes...... just a kid, don't blame me! Dan in Taiwan, hit the 59 orbits mark today! I don't know much about Charlton Heston; he'll always be "Ben Hur" to me. As for his politics, I don't know what the "racist" term refers to in his case (again, he's "Ben Hur" to me), so I'm unfamiliar with that. I do know about his NRA days, though. I'm not a big gun fan and when I saw his major polarization to the lobby, I thought of "Ben Hur" with a gun. Thank Goodness someone brings Heston down from the mountaintop. I hadn't seen the cartoon, and I am glad to see it now. I liked his early movies, too, although I must admit that after learning about his extreme conservative views, I couldn't enjoy them anymore. As when I discovered that James Stewart was not, let's say progressive, when it came to race matters. I realize that these men were products of their times, but Heston held firm to beliefs that were cruel. He seemed to go backwards, unless he had ulterior motives for his reported early associations with Rev. King. "Time will tell," as they say. Time told on him. Ding Dong. Dan-you know a lot of "righties" have said they did this and that with Civil Rights, they were former Demos, they were progressives before, etc , but now the party's changed the politics have changed, yadda yadda! Heston was so far right it was scary. Yes he may have been a Civil Rights marcher, but does that lessen his extreme views about guns, war and politics in general in his later life? I did like some of his movies-corny and inadvertently funny, but I'd guess I'd watch 'em!